I have always been the type that will try just about anything. Aside from bugs and organs, I am open to trying the exotic, the boring, and the meaty. When I was recently challenged to go vegetarian for a month, I was hesitant to give it a shot. I have been eating meat my whole life, and while I choose not to eat a lot of red meat, I enjoy my chicken, turkey, and fish, especially in the summer months when I can throw ’em on a grill. At the same time, I did not want to turn down a food-related challenge, and since I do eat a lot of fruits and veggies, I thought, how bad could this be? To my surprise, being a vegetarian was a lot easier than I thought. Once I was committed, I went shopping and bought some good sources of protein, like lentils and beans, edamame, quinoa, and tofu. Since I was at Trader Joe’s, I also picked out some tasty veggie burgers and falafel. Why not make being vegetarian as tasty as possible? As I began my vegetarian journey, I was surprised by how satisfied and energized I felt after meals. I would finish a meal feeling content, but not stuffed or ready for a nap like I do at times after a meat-filled meal. I experimented with different flavors and textures. And it helped that I could still indulge in my favorite meal of the day, breakfast, without missing out on eggs, hashbrowns, and pancakes. I truly didn’t even miss bacon (Go ahead, roll your eyes at me)! The biggest challenge that I faced was going out to eat, but I could always find something. And it usually was really, really good. The best part of going to restaurants was that I ordered dishes that I probably would never have picked, such as black bean burgers, vegetable stir-fries and wraps, and veggie pastas. I realized that meat didn’t always need to be the star of the show. 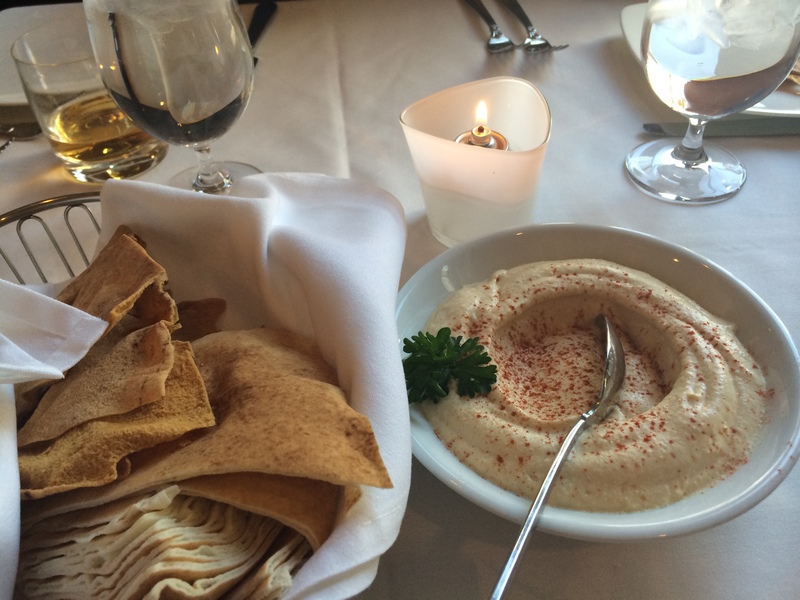 The best dining experience that I had during my vegetarian month was at Phoenicia in Birmingham. Phoenicia is beautiful inside and out. Phoenicia’s owner, Sameer Eid, is often present, making sure everything is top-notch. He purchases fresh produce and meats from Eastern Market to ensure the finest quality of food for his customers. I love when restauranteurs take extra steps to please their guests. The prices reflect the high-caliber ingredients used, so this restaurant is ideal for special occasions. Trust me – it is worth the splurge. Phoenicia is heavily Middle Eastern, but also offers unique items such as their amazing ribs. 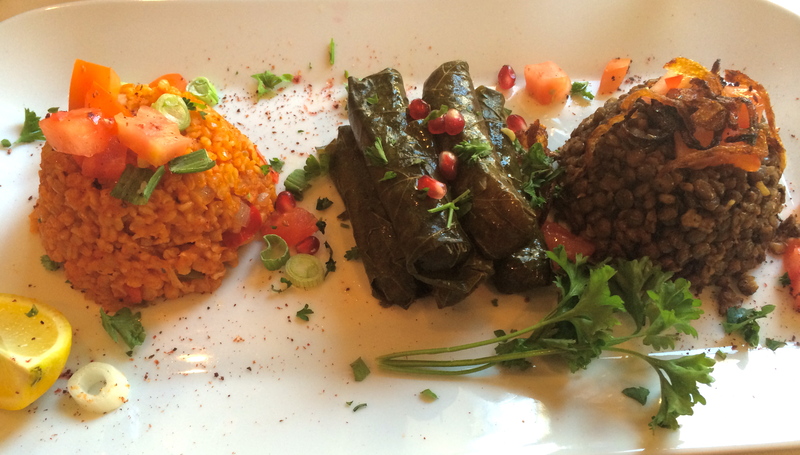 However, I had to settle on ordering a vegetarian trio of bulgur with tomatoes, Mjadra (lentils), and vegetarian grape leaves. Once I took my first bite, I completely forgot about meat. Everything was perfectly cooked and seasoned. I was in vegetarian heaven! I left with a satisfied tummy and a to-go box, excited to eat my leftovers the following day. While my vegetarian month has come to an end, I find myself continuing to go a day or two without meat during the week. While I expected to go running back to my beloved fish and chicken, I find myself craving meat a lot less. While I still will eat just about anything, I think my digestive system appreciated the break, and my brain appreciated having to work a little bit harder be creative during mealtimes. If any of you daring foodies are contemplating trying a vegetarian diet, it is a lot less scary than it seems. With so many vegetarian and vegan restaurants and grocery items, you are bound to find yourself exploring and tasting new and exciting foods. To me, that was the most rewarding part of this experience, in addition to the environmental benefits. If any of you give it a try or are a committed vegetarian/vegan, please share what you love most about your diet. Also, see below for info about Phoenicia! Phone #: (248) 644-3122. They take reservations and offer take-out. Hours: M-Th. 11 a.m. – 10 p.m., Fri. 11 a.m. – 11 p.m., Sat. 5 p.m. – 11 p.m., Sun. 5 p.m. – 9 p.m.